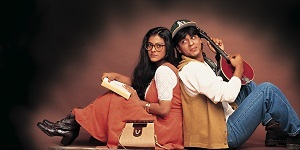 THEY’VE DONE IT – 20 years after appearing on screen together in “Dilwale Dulhania Le Jayenge” – (‘The Brave Hearted will get the bride’), Shah Rukh Khan and Kajol have been voted the most romantic screen couple of all time. They finished top of the pile in the British Film Institute’s (BFI) online poll to find the greatest couples both on the big and small screen. ‘Raj’ and ‘Simran’ from “Dilwale Dulhania Le Jayenge“, also known popularly, as DDLJ, beat off the other choices which included Jesse & Celine from the “Before Sunset” trilogy; Scarlett & Rhett from “Gone with the Wind” and Rick & Ilsa from “Casablanca”. Both Shah Rukh Khan and Kajol were in London promoting their latest film , “Dilwale” (‘Big-hearted‘) just over a fortnight ago. The film has done brisk business in India at its opening, with many filmgoers excited by the prospect of seeing the couple in action together and recreating their special, some would claim unique, chemistry. 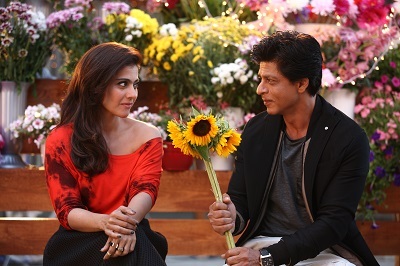 However, the producers, with Khan, among them, were keen to dispel any idea that “Dilwale” is connected to the 1995 film in any way, despite its title. They are not the only couple in the film (see picture below). She did, but admitted that she had only heard about it when she had arrived in the capital that day. She said it was “amazing” to be in such exalted film company. “I’ve seen those films. That is just awesome. I love romantic films – I am a chick,” she added, guffawing. The two also appeared together on the BBC One evening prime-time show, “The One Show“, talking about their success and reminiscing over ‘DDLJ‘. The poll was conducted as part of the BFI’s winter season devoted to love, #BFILove which has featured a number of films between October and December and still has some days to run. There were several Indian and British Asian perspective films that featured including a whole weekend devoted to the work of Bollywood and Tamil film director, Mani Ratnam. Look out for reviews on “Bombay“, “Dil Se” and “OK Kanmani” coming soon. ‘DDLJ‘ scored highly in the UK regional breakdowns – coming top in London, East of England, Northern Ireland, Scotland, Wales, and Yorkshire. There was also a TV poll in which newcomers Claire (Caitriona Balfe) and Jamie (Sam Heughan) from fantasy adventure “Outlander” (2014), from Amazon Prime’s VOD service, took top spot. Ross (Aidan Turner) and Demelza (Eleanor Tomlinson) from BBC1’s “Poldark” (2015) topping the British vote. The poll was conducted as part of the BFI’s major UK-wide season dedicated to romance on the big and small screen – BFI LOVE in partnership with Plusnet. If you want to tell us what you think of the poll results, please go to our FACEBOOK page. ‘A Billion Colour Story’ (Review) – Where has the poetry of India gone…? ‘Rustom’ – All Indian hero or playing to the gallery…?